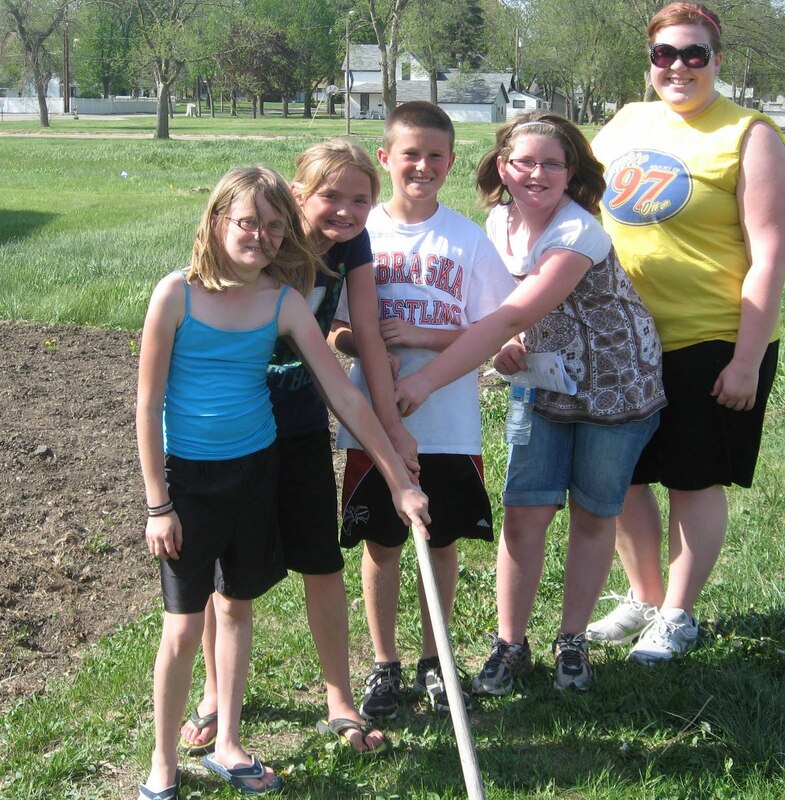 Fillmore County 4-H’ers Sidney Jividen, Erin Schmidt, Cole Jividen, Tori Stoldorf and Extension Intern Molly Trausch planted several vegetables and flowers in the Fillmore County community garden. For more information or to help, contact Fillmore County Extension or Fillmore County FSA. One of the integral parts of the 4-H youth development program is community service. With community service come collaborations with other organizations. Recently, two 4-H community service projects were completed in Fillmore County. As part of the Barn Quilts of Fillmore County project, 4-H’ers selected, painted and constructed an 8’x8’ quilt block. The quilt block, an adaptation of a clover quilt block, was recently hung on the grandstand at the Fillmore County Fairgrounds. Over the past year, 14 volunteers put in over 35 hours prepping and hanging the quilt block. Fillmore Central FFA members provided the strength to hang the 125 pound quilt block. The quilt block can be seen from K street and will remain on display for years to come. The 4-H quilt block is sponsored by the Fillmore County Agricultural Society and the Fillmore County 4-H Council. Fillmore County Farm Service Agency and Fillmore County 4-H have teamed up to plant a community garden. Local FFA Chapters and other organizations interested in participating are welcome. A small crop of popular vegetables was planted by 4-H’ers on May 9, west of the FSA office. Produce will be donated to those in need and the Meals on Wheels program. FSA and 4-H will be caring for the garden throughout the summer. The community garden is part of the Let’s Move Initiative started by First Lady Michelle Obama. The initiative works to solve the challenge of childhood obesity within a generation. Let’s Move Faith and Communities is designed to support local efforts and highlight accomplishments in communities across the country. – Developing 2,600 school gardens in 2011 that will yield over 650,000 pounds of fresh produce, provided to those in need. – One million young people get involved in community gardening. Fillmore Central FFA members and 4-H members recently hung the Fillmore County 4-H barn quilt at the Fillmore County Fairgrounds. The barn quilt is part of the Barn Quilts of Fillmore County project.